Ancient artistic techniques merge with present-day skill, talent, and energy as the Shen Yun Performing Arts company continues its tradition of unique, renowned performances this spring with a whole new selection of songs, dances, and musical scores celebrating 5,000 years of ancient Chinese culture. Extolled by audiences as "the experience of a lifetime," a Shen Yun performance showcases the values, virtues, spirituality, and creativity that once flourished in the Middle Kingdom (aka China), which the ancients preferred to call Shen Zhou, "the Land of the Divine." The performers combine long-ago legends and traditional music and dance with modern-day heroic tales, high-tech backdrops, elaborate costumes, and a live orchestra for a stirring, cross-cultural experience designed to inspire hope and joy. In each piece, elements of Eastern philosophy combine with universal themes of harmony and peace. Shen Yun performers embrace the traditional Chinese idea that artists must cultivate inner goodness in order to create true art, and this positive attitude shines through each performance. Sadly, the traditional Chinese culture displayed by Shen Yun cannot be presented in today's China, where it is viewed as a threat by the current Communist regime. Shen Yun began its 2019 tour at Lincoln Center in New York last month, and will proceed with performances in Philadelphia, Chicago, Phoenix, Las Vegas, Los Angeles, Washington, D.C., Seattle, and more than 50 other U.S. cities with another stint at the Lincoln Center in March. Shen Yun Performing Arts is a nonprofit organization, based in New York and dedicated to reviving ancient Chinese culture. The organization has grown to include six companies, and the 2019 schedule includes shows at 120 of the world's top venues, with an estimated audience of 1.3 million individuals. The San Francisco Chronicle described a Shen Yun performance as "a visually dazzling tour of ... Chinese history and culture." Others have been similarly complimentary, as they witness this unique portrayal of the impact of the divine on Chinese civilization and a culture that embraces living in harmony with nature and with the universe. Visit shenyun.com or the company's YouTube page www.youtube.com/shenyun for more information and a taste of the Shen Yun magic. 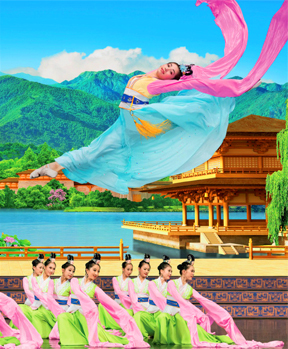 For Shen Yun 2019 tour schedule and tickets, visit: www.shenyun.com/tickets.